(P1) If only everyone who was WRONGFULLY arrested could enjoy an AFTERMATH like this. (P2) Wednesday proved to be a little different than Monday for 14-year-old Ahmed Mohamed. (P3) Mohamed made a digital clock to impress his teacher. (P4) His school, MacArthur High in Irving, Texas, called the police on Monday. Five uniformed men arrested him and accused him of making a HOAX bomb. Oh, and they HANDCUFFED him. “For his own personal safety and that of his officers,” as the police later said. (P5) The fact that he’s dark-skinned, has the last name Mohamed, and is a Muslim seem to have encouraged the police toward taking additional safety PRECAUTIONS. (P6) Once the police paused to consider the facts — or, rather, once Mohamed and his family began talking to the media — the young science BUFF became a symbol for progress. (P7) Everyone from President Barack Obama to Hillary Clinton to Facebook founder Mark Zuckerberg invited him to visit. (P8) But what about Ahmed himself? Not every NERDY teen could face the cameras of America’s media. Yet here he was on Wednesday at a PRESS CONFERENCE, celebrating that the hoax-bomb charges had been dropped. (P10) He said he really wants to go to MIT. He also revealed that he’s thinking about transferring out of MacArthur High “to any other school.” He was FULSOME in his praise for everyone on Twitter and Facebook who had supported him. (P11) The #IStandWithAhmed hashtag has become a focus for those who believe he was ILL-TREATED and that he’s just a nerdy kid trying to make things. (P14) He’s not KEEN on talking about his latest inventions, because he wants to get them PATENTED first. (P15) Once this was over, Mohamed appeared on MSNBC. There he said that the police, when they arrested him, didn’t even let him contact his parents. He was INTERROGATED for an hour and 25 minutes, he said. (P16) And then MSNBC’s Chris Hayes introduced Dr. Chanda Prescod-Weinstein from MIT. She told Ahmed he was her ideal student, but please could he think about switching to physics. Prescod-Weinstein is an astrophysicist. And of course she invited him to visit. (P17) A spokeswoman for the Irving Independent School District said during a press conference that “the information that has been made public to this point has been very UNBALANCED,” according to The Washington Post. She said all the school was doing was ensuring the safety of everyone on campus. (P18) All the school seems to have ensured for now is that Ahmed Mohamed will have a very different life from the one he might have imagined a week ago. Do you think that the arrest of this student was an example of ISLAMOPHOBIA, or just a mistake by school authorities? Are we doing enough to encourage our brighter students? Do you think that you would handle sudden fame well? 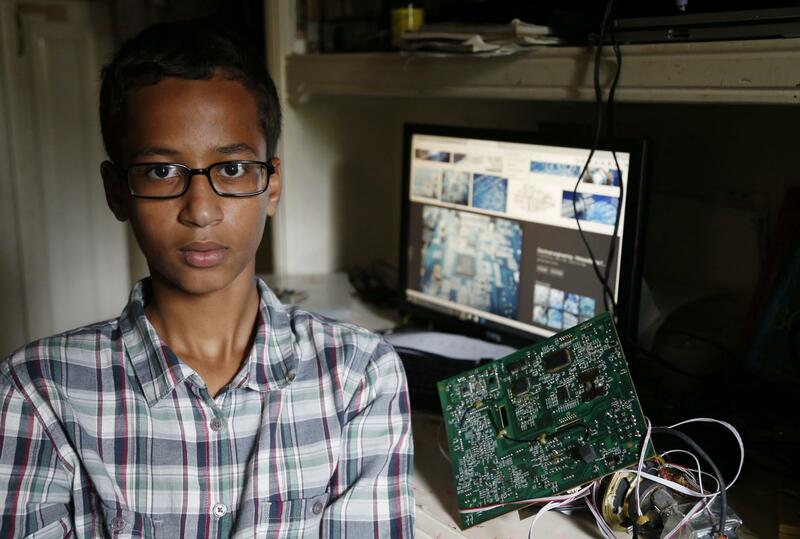 Has this incident opened up new opportunities for Ahmed Mohamed?